Fits: 1999-'18 HD® big twins and 2000-'19 HD® Sportster® and 2017-18 M8 models. 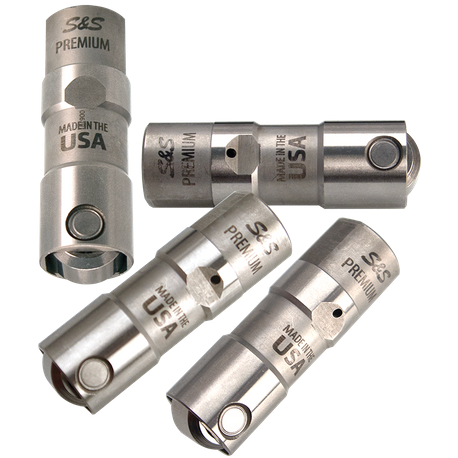 Features and Benefits: Reduced valve train noise from start up to shut down. Close tolerances for low leak down rates - fast pump up and superior high rpm performance. Low mass, bearing grade, silicon nitride check ball and lighter check ball spring - enhances fast pump up and quiet operation. 100% tested to ensure that leak down and top end oil flow are within specification. Does not include HL2T kit. I have run Feuling and Bob Wood lifters. The Feuling gave out after 10k miles and Bob Wood Alpha Directional are extremely noisy. I installed these and I am EXTEMELY IMPRESSED!!!!! Very quite and the oil pressure is back to where it was. I highly recommend these lifters.